Dr. Carlos Latorre earned two degrees in geology and worked at the U.S. Army Corps of Engineers, Engineer Research and Development Center (ERDC) in Vicksburg for six years before deciding he really wanted to study medicine. Now, after seven years of experience in family medicine, Latorre is switching gears again as he joins the Mississippi Division of Medicaid (DOM), becoming the agency’s first full-time medical director. 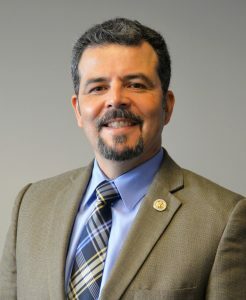 Originally from Puerto Rico, Latorre first came to Mississippi after high school to attend the University of Southern Mississippi (USM), following on the heels of his brother and sister who had already relocated to the Magnolia State. After earning his Bachelor of Science and Master of Science degrees in geology at USM in 1992 and 1994, respectively, he spent two years working at the John C. Stennis Space Center before being recruited by the ERDC and moving to Vicksburg. After earning his medical degree from the University of Puerto Rico, School of Medicine, Latorre returned to Mississippi for family medicine residency training at the University of Mississippi Medical Center from 2008-11. Latorre worked as a family physician in Vicksburg for six years before serving as deputy chief medical officer for the Veterans Health Administration in Texas for one year. Those experiences gave him a unique outlook that he hopes will be valuable in his new role at DOM. Latorre succeeds Dr. Tami Brooks, who served as part-time medical director at DOM from late 2014-June 2018, and Dr. Jason Dees, who served as interim medical director from July-November 2018. Latorre began his new role on Nov. 26. Latorre lives in Vicksburg with his wife and their 15-year-old daughter.